Been waiting since the Pilgrim for a breakout performance from him and he delivered big-time. With his action, cruising speed, pedigree, and ability to run horses into the ground, he can do it all. Final 3 furlongs in :36 2/5 was impressive. Just have to be careful he didn’t peak too early. With new stars developing every weekend he’s pretty much in limbo, trying to get sharp and fit for the March 13 San Felipe. Then it’s crunch time, with three weeks to the SA Derby and four weeks to the Kentucky Derby. Out of sight, out of mind, but he’s still the champ and a worthy one. Baffert said on"At the Races With Steve Byk" Monday he's also considering the Rebel Stakes. Most of his stablemates are way ahead of him and he has some catching up to do with little room for error. And he’s not going to have an easy time of it if he debuts in the March 6 Gotham. But that’s a perfect spot for him to take back off the pace, with Sidney’s Candy and Tiz Chrome likely heading that way. He seems out of place among the Pletcher, Baffert, and Lukas glitterati crowd, but until someone figures out how to beat him, he fits right in, and his blood is as blue as any of them. We’ll get a better line on him when he takes on the champ next. He ran to his works and 2-year-old form, controlling the Risen Star Stakes right from the start with dawdling fractions. Would rather have seen him sit off the pace, but no one wanted the lead and he rated kindly with his ears up the whole way. He’s already shown he can rate. 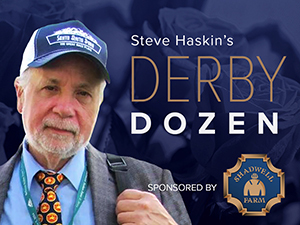 Now that things are heating up on the Derby trail, he has to show he can beat better quality horses in larger venues. As of now, Pletcher has a number of horses with similar running styles and they’re all extremely talented. Something’s gotta give. If you like Caracortado you have to like this colt, who was coming on strong in the Robert Lewis in only his third career start and first in almost three months. Strong female family and a relentless stretch run make him dangerous as the distances stretch out. Only question is dirt. Epiglottis surgery obviously worked, and he’s returned to his old form. He had to come from far back after a slow break and fighting the rider early, swung very wide into the stretch and was closing fast, but ran out of room with finish line at the sixteenth pole. His final quarter in :24 4/5 was solid considering three-quarter marker was well up on the turn. Yes, he’s only won a maiden sprint and an allowance race at Tampa, but for sheer power, action, pedigree, and overall style, he’s one of the more visually impressive 3-year-olds seen all year, so ranking him high based on potential. Now that he’s back working steadily he should be on a decent schedule, but with only two Derby preps likely. He’s as tough and honest as they come. He has a ton of speed in his pedigree, but stout tail-female line is carrying him. Still have major doubts he can carry his speed 10 furlongs, with a contentious pace likely, but there’s something for being undefeated, and his Southwest was a big effort, cutting out wicked fractions from the 9-post. Like the way he dug in at the end when Dublin came charging up to him and was still in front at the regular finish line. Where was Lezcano going? He was in a good spot before sending him into a hole that wasn’t there. He just needed a solid race, coming back at 1 1/8 miles, but timing-wise, this was a disaster, as he got little out of the race and now has to regroup. If he bounces out of it OK, the March 13 Tampa Bay Derby would at least give him two more preps, which he needs. To participate, use your cursor to drag the selections on the left to the blank placeholders on the right. Once you have completed ranking all of the horses, submit your entries and compare your results to the rest of the community. A first place ranking will earn 12 points, second place receives 11 points, and so on.